The watermark ("GlobalWholesaleArt.com") will not appear on the actual painting. NOTE: Every oil painting we sell is 100% hand-painted on canvas by a skilled artist. If you select a frame, your oil painting will be delivered to your door completely framed and ready to hang on your wall. We even supply you with the hooks! To order a custom size, click here. Our artists will paint to any size. All frame purchases include free canvas stretching, mounting and all hanging hardware. 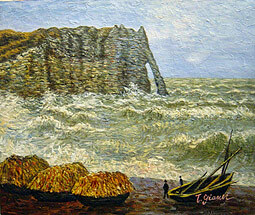 "Etretat, Rough Sea" by Claude Monet is a 100% hand-painted oil painting reproduction on canvas painted by one of our professional artists. Our experienced artists start with a blank canvas and paint each and every brushstroke entirely by hand! 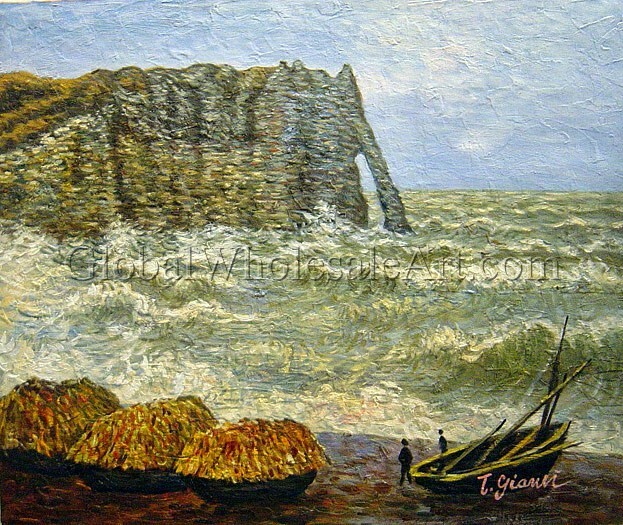 Global Wholesale Art is the premier source for exquisite hand-painted Claude Monet oil painting reproductions on canvas at wholesale prices. All of our Claude Monet oil paintings are 100% hand-painted on canvas by our skilled artists and are absolutely magnificent! Please be assured that we DO NOT sell canvas transfers or prints that have brushstrokes applied on top. At Global Wholesale Art, you are buying a genuine signed oil painting on canvas that is painted from scratch by one of our talented master artists. Every Claude Monet oil painting reproduction starts with a blank canvas and is entirely painted by hand until the oil painting is completed. With each beautiful brushstroke, our artists capture every detail and character of the original Claude Monet oil paintings. We promise that as beautiful as the oil paintings appear on our website, they are truly 10 TIMES more beautiful in person! Simply put…our oil paintings are spectacular! !